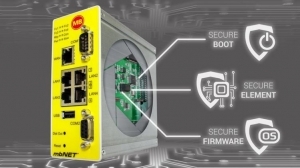 Thanks to hardware-based storage of certificates and encryption, the security of the industrial router mbNET is significantly improved. Both the data communication and the routers themselves are much less vulnerable. A security chip (secure element) serves as a secure safe for passwords, certificates and keys. These are neither readable nor manipulatable - not even by a hardware hack. The data from processes and applications, such as remote maintenance connections or the web interface, are stored in an encrypted container, each are protected against each other and to the outside. This protects the user data against spying and manipulation. The security of the router itself is ensured by a fixed programmed bootloader (Secure Boot), which only accepts signed firmware updates in accordance with the stored security certificate (Secure Firmware). A new firmware is only started when the check was successful - otherwise the router starts with the previous firmware. Galvanically isolated digital inputs and outputs as well as an extended temperature range from -25 ° C to + 75 ° C complete the new development. All customer applications are unchanged, the devices are fully compatible with the existing routers of MB connect line.